This whimsy, one of my “post-life” gatherings of characters, has Leopold Mozart, Wolfgang’s father, condemned for eternity to give lessons to aspiring violinists. Violinists are heard warming up backstage prior to a recital for parents and friends. 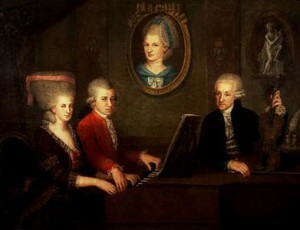 Nannerl, Leopold’s daughter, is at the piano readied to accompany the lot. As Leopold addresses the gathered audience, a cell phone goes off: Albert Einstein’s calling for the nth time about a violin lesson. A critic from the audience identifies the intrepid caller, explains Einstein’s love of Mozart, and his desire to study Mozart with his Papa, who else? 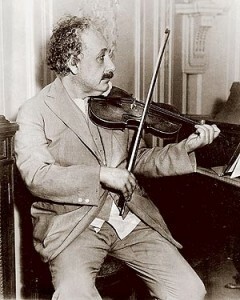 Einstein then appears on stage, battered violin case in hand, ready for his lesson. The equation is set: E (Einstein) = M (Mozart) C (Complication) squared. I crafted this piece in 2006 as part of Amadeus and Albert—a multi-day celebration and exploration of the 250th Wolfgang Amadeus Mozart, and the 100th anniversary of Albert Einstein’s publication of his five most important papers, including his theory of relativity, quantum mechanics, and the nature of light. The role of Nannerl can be played by a bona fide pianist as she has but one line repeated throughout the play. But as in any theme and variation form there is always a possibility of a codetta, a reconfiguring of a single chord or extrapolation of a phrase not previously touched upon.